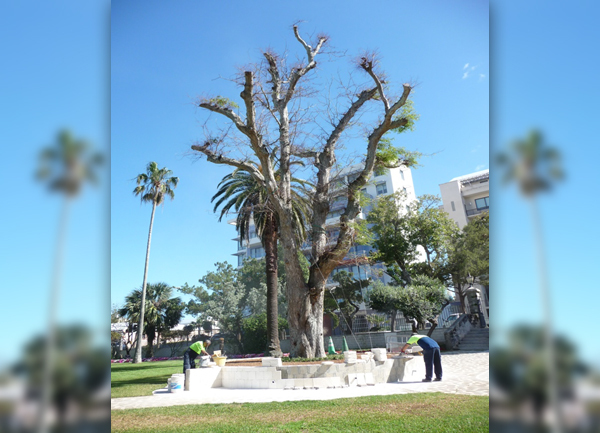 The Bermuda Environmental Sustainability Taskforce [BEST] have praised the Corporation of Hamilton for their “amazing efforts” to preserve the Tamarind tree in Hamilton, which was damaged by Hurricane Fay. BEST said said, “For those who have walked through or past Victoria Park in the last few months, you will have seen the Corporation of Hamilton employees working diligently in the maintenance and preservation of a number of trees. “Hurricane Fay, in October of 2014, knocked down and damaged a number of beautiful old trees, and since then the Corporation’s Parks Department has been working to save and preserve a number of the damaged trees. “Their latest effort is the Tamarind tree which is at located at the Cedar Avenue entrance to the Park. The tree was completely blown over by Hurricane Fay. In order to save this tree, approximately 20ft had to be pruned from the top in order to right the tree and cables had to be used to support the tree after the roots had been damaged. “In the picture above, you see that the cables have been moved closer to the tree trunk and an enclosure is now being built around the tree. The enclosure will further support the tree as well as provide shaded seating for Park visitors. “BEST would like to applaud the Corporation of Hamilton, and in particular their Parks Department, for their amazing efforts to preserve this majestic tree. Save a tree but not the Bird cage on front Street smh.